This book is not meant to be a user manual. It is meant to teach students how they can work with a computerized accounting system. The intention is that students will come away from this book with a knowledge of the principles of accounting, not data-entry skills, needed to be successful in business. Each new copy of this book includes access to a 5-month trial of the QuickBooks 2019 Premier software. Codes are distributed through Intuit Education's website. Students should refer to the insert at the front of the book, which contains instructions on obtaining the code and downloading access to the complimentary software. The Intuit® QuickBooks Certification exam is an online exam that is proctored at Certiport Authorized Testing Centers. The certification program validates QuickBooks accounting skills while providing students with credentials that demonstrate real-world abilities to prospective employers. Once passed, test takers receive an official digital certificate representing their skills in QuickBooks. The author has prepared a map correlating the chapter content to the Certiport domains that can be found under Instructor and Student Ancillaries on this website page. The map helps students focus their review for the QuickBooks User Certification exam so they can streamline their exam preparation. 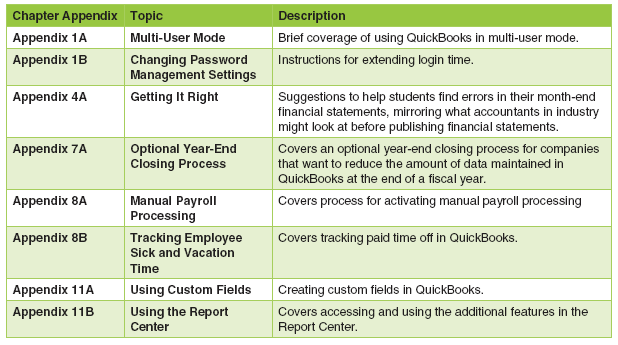 The first chapter introduces students to the basic structure of QuickBooks 2019. • Two "find and fix" Extra Credit assignments. Two QuickBooks company files containing errors (7 or 8) in classification and timing are available for extra credit projects. Solutions (backups and PDFs) are available for instructors. • Other extra credit projects: A business memo project and two financial analysis projects are available. • myBusinessCourse: A web-based learning and assessment program intended to complement your textbook and classroom instruction (see separate tab). This easy-to-use course management system includes question banks comprised of practice exercises, test bank questions, and assignment questions related to the end-of-chapter content that can be graded automatically. eLecture videos created and narrated by the author are also available. myBusiness Course provides students with additional help when you are not available. • Access to 5-month trial of QuickBooks 2019 Premier software with purchase of each new copy of the book. • Check Figures are included in assignments, allowing students to focus on the process and reduce frustration. myBusinessCourse is an online learning and assessment program intended to complement textbook and faculty instruction. Access to myBusinesscourse (MBC) is FREE with the purchase of a new textbook and can also be purchased separately. MBC is ideal for faculty seeking opportunities to augment their course with an online component. MBC is also a turnkey solution for online courses. Following are some of the features of MBC.